Primary or idiopathic nephrotic syndrome (INS) is about 15 times more common in children than adults. The overall prevalence of INS in childhood is approximately 2–5 cases per 100,000 children. INS is characterized by massive proteinuria (>40 mg/m2/h), hypoalbu-minemia, and edema with or without hypercholesterolemia and hypercoagulability. By presuming to have minimal lesion disease (which is most common variant), these cases are treated with prednisolone (60 mg/m2/day) for four to six weeks and then at the same dose on alternate day for the next six weeks. Most of the cases respond quickly to steroid therapy with nil or minimal proteinuria. These responders are termed steroid sensitive (SS). Some cases require higher doses of steroids for a longer period or stronger immunosuppressive drugs such as cyclophophamide, cyclosporine, and levamisole etc., At present, there is no sensitive clinical or laboratory marker to predict the prognosis of INS at the onset. The degree of proteinuria at the onset and protein selectivity index (immunoglobulin:albumin ratio) were used in the past, but they failed to be reliable prognostic predictors. Oxidative stress is reported in cases of INS. Proteins get carbonylated when exposed to excess free radicals. Hence, we planned this study to compare the protein carbonyl content in urine among steroid responders and steroid non-responders (SD + SR). Furthermore, to evaluate urine protein carbonyl content (UPCC) as a marker to predict steroid dependence and resistance (SD and SR) INS cases. This study was conducted in the Department of Biochemistry at Jawaharlal Institute of Postgraduate Medical Education and Research (JIPMER), Puducherry, in collaboration with the Department of Pediatrics. This study was approved by the Institute Research Council and Human Ethical Committee, JIPMER. A total of 70 children with first-onset INS were included in this study. Among them, 47 children were found to be SS and 23 were detected to be either SR or SD cases of INS, as confirmed from the response to prednisone therapy and renal histopathology. All cases were between one and eight years of age, and they were not suffering from any other major illnesses. Their parents/guardians were informed about our study, and written consent was obtained from them to include their children in our study. Assents were also obtained from the children. After confirmation of the diagnosis of INS, about 100 mL of casual urine samples was collected from each newly diagnosed case in the pediatric outpatient department, nephrotic clinic, or the children’s wards before starting the steroid therapy. Children with secondary nephrotic syndrome, suffering from organ dysfunction or endocrinal disorders were not included in our study. The protein from the collected urine samples was precipitated by centrifuging with trichloroacetic acid. The protein precipitate was stored at −50°C. From the precipitate, UPCC was quantified by modified Levine’s method. All the cases were followed up at least for 18 weeks. Children with first-onset INS who responded to steroid therapy with resultant or trace or nil proteinuria were grouped as SS cases of INS and children who continued to have proteinuria (2+ or greater) even after eight weeks of steroid therapy were labeled as SR. A subset of patients who had a relapse while they were on alternate day steroid therapy or within eight weeks of stopping prednisone were treated with oral prednisolone (60 mg/m2/day) and responded well; they were also included as SSNS. Data are presented as the mean with standard deviation. For comparison of the means, Mann–Whitney U-test was used. A receiver-operating curve (ROC) was drawn to determine the optimum cutoff limit for UPCC to predict SD and SR. P <0.05 was considered statistically significant for all the statistical tests. Since the sample size of SR and SD cases of INS was small and to check if the data from such small size sample can be validly extrapolated for a large population, the Markov Chain Monte Carlo (MCMC) iteration procedure is applied in WINBUGS 2.14 1. (www.mrc-bsu.cam.ac.uk/bugs/winbugs/ contents.shtml). In this observational study, we have recruited seventy cases with first onset INS. Among them, 47 responded with trace/nil proteinuria and were included in Group A (SS cases). There were 23 cases in the Group B (SD + SR cases). The mean urinary protein-bound sialic acid (UPBSA) levels were compared between these groups. The UPBSA levels were significantly higher in the SRNS cases compared with the SSNS cases [Table 1]. Table 1: Comparison of demographic characteristics and the baseline biochemical parameters between Group A (SS) and Group B (SD + SR). [Table 1] shows that UPCC was significantly higher in SD + SR groups than SS group of INS. ROC curve showing sensitivity and specificity at different cutoff values of UPCC for differentiating SD/SR cases of INS from SS cases (area under the plasma concentration–time curve: 0.833; P< 0.05). [Figure 1] shows the cutoff limit for UPCC of 7.02 nmoles/mg protein is optimally sensitive (83.3%) and specific (85.2%) to predict if the cases are going to be SR or SD. Figure 1: ROC curve showing sensitivity and specificity at different cutoff values of UPCC. The statistical model with MCMC was used to obtain convergence results of the data set. [Table 2] reveals the cutoff marks detected through posterior mean (standard deviation). It shows that patients with a protein carbonyl value of more than 5.10 (0.43) nmoles/mg of protein are likely to be SR or SD. Table 2: The posterior mean and HPD of UPCC in INS. INS cases usually present with massive proteinuria, hypoalbuminemia, edema, hyperlipidemia, and hypercoagulability. The presentation is similar at the onset irrespective of their response to steroid therapy. Hence, it is important to find a clinical or diagnostic marker which can predict SD or SR at the onset of INS. Proteins get carbonylated when they are exposed to free radicals, hence quantifying protein carbonyls is an index of oxidative stress. SD and SR cases of INS must have higher levels of protein carbonyls as the degree of oxidative stress is higher in them compared to SS. Imbalance between oxidant/ antioxidant status in INS was reported by many authors., Oxidative stress for longer duration results in systemic inflammation, which enhances the proteinuria by increasing TNF-α and other pro-inflammatory cytokines damaging podocytes., A higher level of oxidative stress in SD and SR cases may indicate that glomerular damage and proteinuria are more in SR and SD cases. Recently, the same group of authors reported that UPBSA is significantly higher in SD and SR cases of INS compared to SS cases. 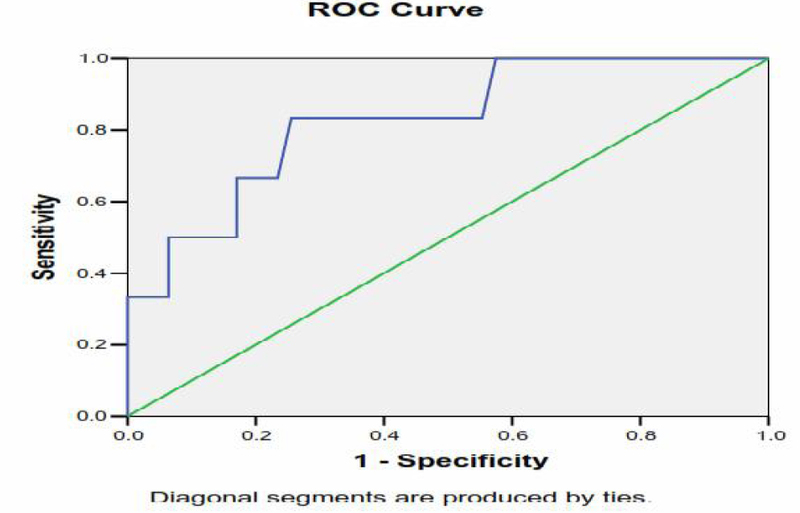 It is useful marker at 2.71 μg/mg of protein with 75% sensitivity and 75.5% specificity for differentiating SS cases from SD/SR cases [area under the curve (AUC) = 0.814, P = 0.009] . UPCC could be a better marker with 83.3% sensitivity and 85.2% specificity (AUC = 0.833, P <0.05). Results confirm that UPBSA and UPCC are higher and associated with higher degrees of oxidative stress in SD/SR cases of INS. As our sample size was small and there was a disparity between the SS and SD/SR cases, we used MCMC iteration procedure to extrapolate the results obtained to a larger population. The cutoff was 5.10 (0.43) nmoles/mg of proteins for predicting the SD/SR cases of INS. Thus, the authors suggest using both markers (UPBSA and UPCC) together to get higher sensitivity and specificity. Antioxidant supplementation may be beneficial in SR and SD cases as oxidative stress plays a role in the pathogenesis of SR and SD types of INS. Pediatric cases of INS with urinary protein carbonyl values more than 5.10 (0.43) nmoles/ mg are more likely to develop SR or SD. One of the authors, Dr. Niranjan Gopal, acknowledges Indian Council of Medical Research (ICMR), Ansari Nagar, New Delhi-110029, India, for awarding the grant to carry out MD/MS thesis (No. 3/2/2007-08/PG-Thesis-MPD-5; dated 11/03/2008). Niaudet P. Steroid-sensitive idiopathic nephrotic syndrome. In: Avner ED, Harmon WE, Niaudet P, eds. Pediatric Nephrology. 5th ed. Philadelphia: Lippincott Williams & Wilkins; 2004. p. 545-73. Burgstein JM. Nephrotic syndrome. In: Behrman RE, Kliegman RM, Jenson HB, eds. Nelson Textbook of Pediatrics. 18th ed. Philadelphia: WB Saunders; 2008. p. 2430-42. Ding WY, Koziell A, McCarthy HJ, et al. Initial steroid sensitivity in children with steroid-resistant nephrotic syndrome predicts post-transplant recurrence. J Am Soc Nephrol 2014;25:1342-8. The primary nephrotic syndrome in children: Identification of patients with minimal change nephritic syndrome from initial response to prednisone. A report of the ISKDC. J Pediatr 1981;98:561-5. Saleem MA, Tizard J, Dudley J, Inward C, Caward R, McGrow M. Disorders of the urinary system. In: McIntosh N, Helms P, Smyth R, Logan S, eds. Forfar and Arneil’s Textbook of Pediatrics. 7th ed. New York: Churchill Livingstone/Elsevier; 2008. p. 545-84. Kamireddy R, Kavuri S, Devi S, et al. Oxidative stress in pediatric nephrotic syndrome. Clin Chim Acta 2002;325:147-50. Ece A, Atamer Y, Gürkan F, Bilici M, Koçyigit Y. Anti-oxidant status in relation to lipoproteins, leptin and pro-inflammatory cytokines in children with steroid-sensitive nephrotic syndrome. Nephrology (Carlton) 2004;9:366-73. Weber D, Davies MJ, Grune T. Determination of protein carbonyls in plasma, cell extracts, tissue homogenates, isolated proteins: Focus on sample preparation and derivatization conditions. Redox Biol 2015;5:367-80. Prasad R, Dayal RS, Srivastava VK, et al. A clinico pathological study of nephrotic syndrome and role of immunosuppressive therapy. Indian Pediatr 1980;12:923. Trompeter RS, Barratt TM, Kay R, Turner MW, Soothill JF. HLA, atopy, and cyclophosphamide in steroid-responsive childhood nephrotic syndrome. Kidney Int 1980;17:113-7. Mathew JL, Kabi BC, Rath B. Anti-oxidant vitamins and steroid responsive nephrotic syndrome in Indian children. J Paediatr Child Health 2002;38:450-37. Rajbala A, Sane AS, Zope J, Mishra VV, Trivedi HL. Oxidative stress status in children with nephrotic syndrome. Panminerva Med 1997;39:165-8. Akyol T, Bulucu F, Sener O, et al. Functions and oxidative stress status of leukocytes in patients with nephrotic syndrome. Biol Trace Elem Res 2007;116:237-48. Choi MR, Kouyoumdzian NM, Rukavina Mikusic NL, et al. Renal dopaminergic system: Pathophysiological implications and clinical perspectives. World J Nephrol 2015;4:196-212. Tapia E, Sánchez-González DJ, Medina-Campos ON, et al. Treatment with pyrrolidine dithiocarbamate improves proteinuria, oxidative stress, and glomerular hypertension in overload proteinuria. Am J Physiol Renal Physiol 2008;295:F1431-9. Gopal N, Koner BC, Bhattacharjee A, Bhat V. Assay of urinary protein-bound sialic acid can differentiate steroidsensitive nephrotic syndrome from steroid-resistant cases. Saudi J Kidney Dis Transpl 2016;27:37-40.